When I was a graduate student at Pranceton, I well remember the Snarkinpiffle brothers. They were an unfortunate mix of stumbling, bumbling, cat tail stomping dunderheads with genius level IQs. I have no sympathy whatsoever for Helen – she should know by now what my sainted mother, Mrs On Mars taught me, Never work with siblings and never work without tuna crisps. 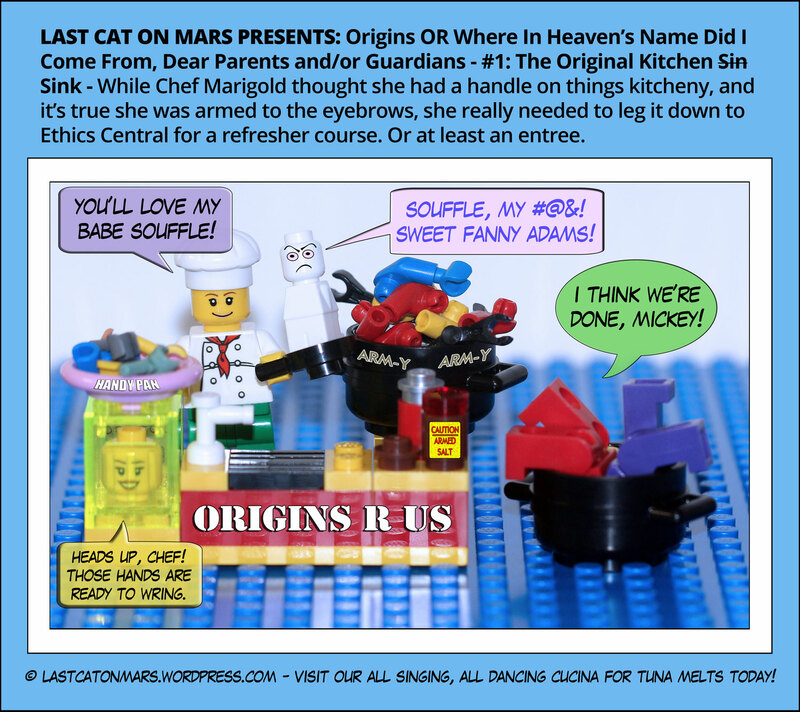 This entry was posted in Science and tagged assistants, body parts, cartoon, comic, laboratory, lego, minifigures, origins, professor on August 9, 2017 by Jay Verney. While I sympathise with the peladophobics of the world, I’m not one to spend my time doing anything but grooming my luxurious fur coat. Fortunately, I am not now, nor was I ever, a doraphobe, nor an ichthyophobe – for someone of my species, that would be, well, unacceptable, also chilly, and hungry-making much. My gratitude knows no bounds. 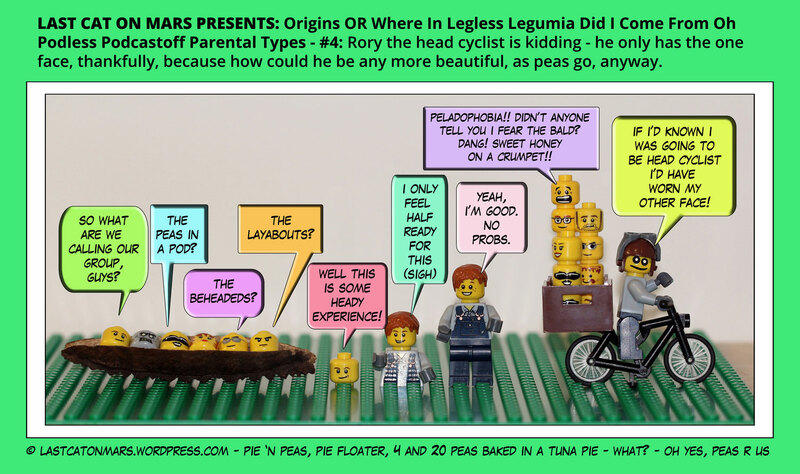 This entry was posted in Variety Show and tagged cartoon, comic, doraphobia, heads, ichthyophobia, lego, minifigures, origins, pea pod, peladophobia on July 12, 2017 by Jay Verney. Did you know that pirates love cats? Yes, they do, in fact, to the tune of 99.9999% repeating and so on, and again, to be not quite precise but most certainly annoying. The earliest known pirates were sailing and raiding quite some time ago, in the 14th century BC (not Before Cats, for those who may be curious). They were called the Sea Peoples, and their preference was for tuna bullion, tuna boullion, and tuna barnacle wedges (with sour light cream). Hence, their affinity, over time, with felis catuseseseses. 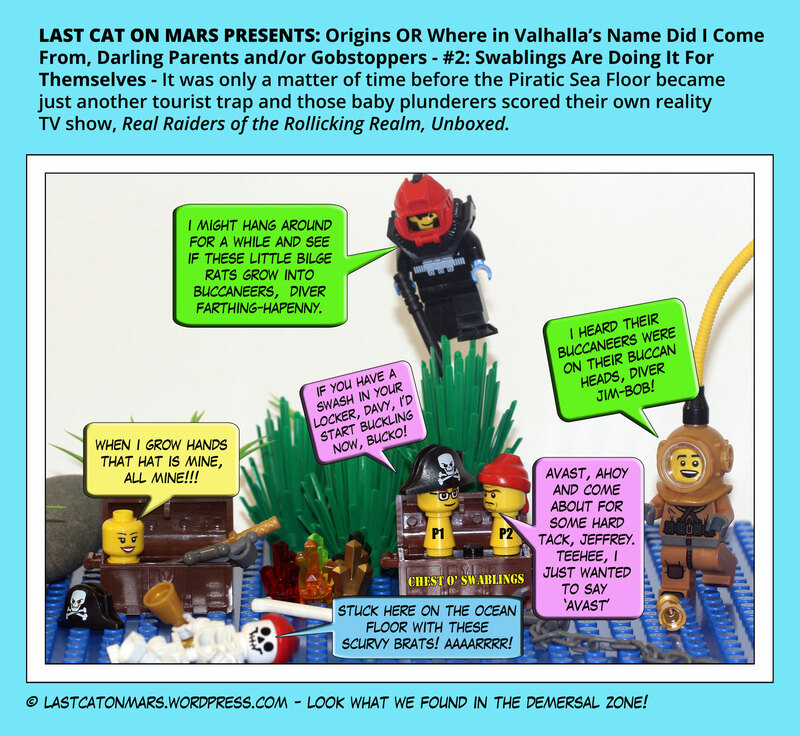 This entry was posted in Variety Show and tagged baby pirates, cartoon, comic, divers, lego, minifigures, origins, pirates, scuba divers, treasure chest on May 17, 2017 by Jay Verney.